It's always fun to find out about new or soon-to-be-released products, don't you think? Naturally! 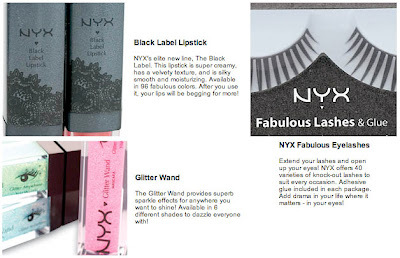 Well, here's a preview of some products by NYX Cosmetics that have yet to be released. I'm most excited about the lipstick. In 96 colors, there should be something for most everyone. Perhaps I'll find my perfect red lippy after all!